Revisiting AN ADVENTURE IN SPACE AND TIME | Warped Factor - Words in the Key of Geek. Today, more than fifty years after it started, Doctor Who is a worldwide phenomenon. When it started though, in 1963, no one was certain that the show would make it to the end of the year let alone run for decades. Indeed, the show faced troubles before it ever got to the screen. An Adventure In Space And Time presented viewers with a dramatization of those early years of the series ahead of the show's fiftieth anniversary in 2013. Even two years later, it remains a watchable and informative account of those early years of the show. The script by Mark Gatiss, who has written episodes of the revived Doctor Who as well as numerous novels and audio dramas based on the series, does a superb job of condensing the events of over three years into a ninety minute production. 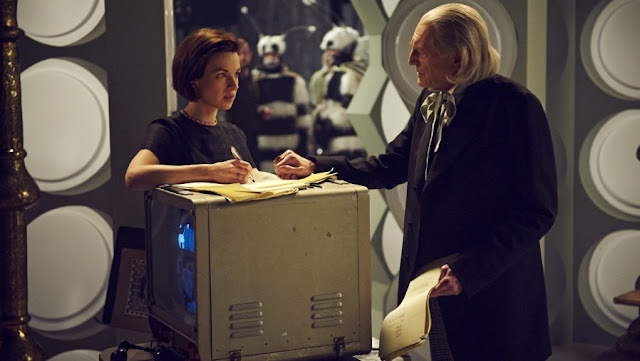 While the running time means that the film can't give everyone their due, there are brief moments for theme tune arranger Delia Derbyshire and the series original associate producer Mervyn Pinfield, Gatiss wisely chooses to focus mainly on a handful of people involved with the series including its original producer Verity Lambert and First Doctor actor William Hartnell. By choosing to focus the film's attention, it allows for a tight narrative that also gets to feature events such as the show's aborted first pilot, its near cancellation as well as presenting off told anecdotes about the early production of the series. While it does make sweeping generalizations at time, it remains true to events, by and large to great success. Along with Gatiss' script, a large part of the success of this production comes from the casting. 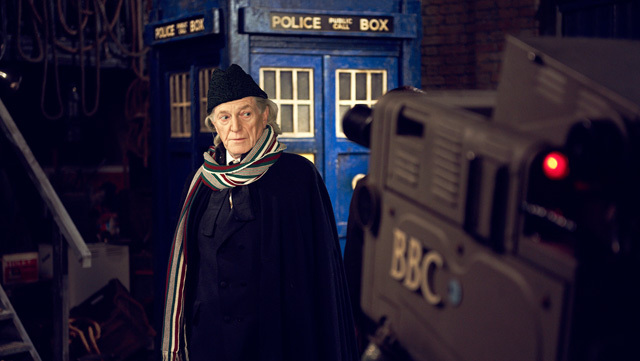 David Bradley as Hartnell was a masterstroke of casting, and while Bradley doesn't have his voice and might be just a tad bit taller than the real Hartnell, he captures the spirit of the man very well, such as in moments as his first lunch meeting with Lambert and director Waris Hussein. Speaking of Lambert and Hussein, both are well cast, with Jessica Raine (who was soon to guest star on Doctor Who itself in the episode Hide) in particular shining as Lambet who finds herself fighting tooth and claw to get her first series as a producer off the ground. Lambert finds an ally in Hussein, played by Sacha Dhawan who bares a strong resemblance to the real life director. A surprising addition to the cast is the noted actor Brian Cox who appears as Sydney Newman, the Canadian born head of BBC Drama who essentially created Doctor Who as part of a major shakeup that followed his coming to the BBC. Cox's Newman bares some resemblance to the real man, though Cox doesn't seem to act much like the Newman, who can be glimpsed in a couple of the DVD documentaries, but he certainly has a presence which benefits the production. There's also a solid supporting cast as well. Lesley Manville plays Hartnell's wife Heather who urges him to take the part and watches his rise to recognition before his health begins to suffer. 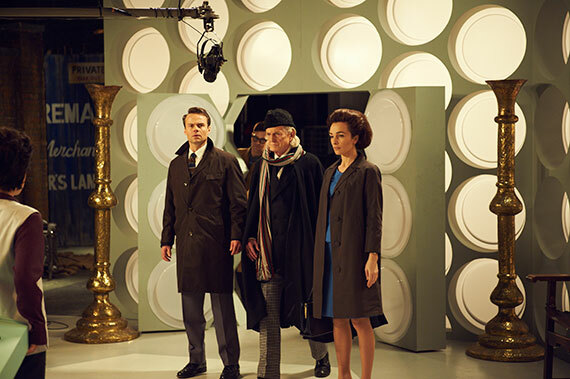 Rounding off the original cast of the series are Jamie Glover as William Russell, Jemma Powell as Jacqueline Hill and Claudia Grant as Carole Ann Ford, with a number of non-speaking actors and actresses playing the various companions from the remainder of the era. Doctor Who fans will spot a number of actors from the show's history in smaller roles such as the real life William Russell as a BBC security guard, companions actresses Anneke Wills and Jean Marsh as party guests, comedian and Doctor Who fan Toby Hadoke as a BBC bartender and modern day Dalek voice actor Nicholas Briggs playing his 1960s predecessor Peter Hawkins. While some of the casting is less than successful (such as Reece Shearsmith as Patrick Troughton who pales in comparison with Bradley's Hartnell), on the whole the cast is strong and does an admirable job of bringing their real life counterparts to life. The other admirable aspect of the film is its production values, especially the sets and costumes. For Doctor Who fans part of the thrill of watching the film is its recreation of the long lost but familiar sets of the show's early years, including the original TARDIS console room set which is recreated in splendid detail. There's also recreations of sets, props and costumes from a number of stories including the first Dalek story, the lost historical adventure Marco Polo, The Web Planet with its Menoptra and the Cybermen from their debut story The Tenth Planet. Outside of the elements and sets from the series, the film does a good job recreating its 1960 settings, from the Hartnell home to the offices at BBC TV Centre. The latter of which is helped in its verisimilitude by actually filming at and inside the real TV Centre, being the last in a long line of productions filmed and recorded there. The latter fact, while sad, also seems fitting given how much of a tribute it plays to the designers and people who worked there on Who and other programs. Indeed, An Adventure In Space And Time is very much a tribute. It's a tribute to the people like Verity Lambert, William Hartnell and Sydney Newman who are amongst many who helped to launch what would become a worldwide phenomenon. It does so with much love and attention to detail that is clear throughout. It's also an impressive piece of docudrama that serves as an example of how to bring to life a sometimes complex story of real events and present them successfully on screen. What more can you ask of it?